Detail of Panoramic View of the Entire Funeral Procession of Arthur, Duke of Wellington, the panel showing the Funeral Carriage by Samuel Henry Gordon Alken and George Augustus Sala, 1853 © National Portrait Gallery, While other versions are in existence, many have been divided and framed in shorter lengths. The Gallery’s version is still in its complete original form and in good condition. London The National Portrait Gallery is to display for the first time the largest portrait in its Collection, a print showing the entire funeral procession of the Duke of Wellington, it was announced today, Wednesday 11 March 2015. At 67 feet long and the length of two London buses (or 67 Wellington boots laid end to end) the epic panorama will be displayed for the first time in the Gallery’s exhibition Wellington: Triumphs, Politics and Passions, opening 12 March, having been stored in its Archive since 1911. Eight panels will be fully visible in the exhibition in a specially made display case housing the entire work. The Gallery will display the print throughout the length of the Victorian Galleries in a free one-hour event on Thursday 18 June, to commemorate the Battle of Waterloo. This will be the first time the panorama will have been seen at full length at the Gallery. Highlights of the work include depictions of the grand and ornate funeral cortege, the Lord Mayor’s carriage, members of the royal family, platoons of soldiers, and, by contrast, the simple but moving image of Wellington’s horse being led in the procession with his master’s empty boots reversed in the stirrups. Visitors to the exhibition will be able to see, alongside the work, a screen displaying the whole length of the work as a moving image. A Portrait Explorer version, viewable in the Gallery’s Digital Space, will allow visitors to see in more detail those in the procession while an iPad app will enable visitors to take the work home with them. After Wellington died in September 1852, his body was laid in state at the Royal Hospital, Chelsea before a grand state funeral. The procession to St Paul’s Cathedral was watched by a crowd estimated at one and a half million people. Other than for monarchs, with the possible exception of that given for Sir Winston Churchill, there has not since been a state funeral on a comparable scale. George Augustus Sala’s panorama was one of many souvenirs produced to commemorate the event. By this time, the controversies of Wellington’s political career were twenty years in the past and feelings had softened. Furthermore, his death felt like the passing of an age. 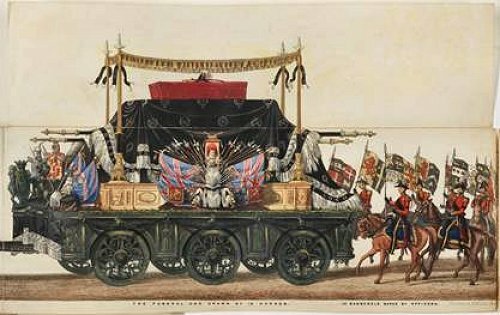 Wellington died as the quintessential Victorian, but his funeral was a reminder of the time forty years before when he gained his heroic reputation. Taking place to mark the bicentenary year of the Battle of Waterloo, Wellington: Triumphs, Politics and Passions (12 Mar-7 Jun 2015) will explore not only the political and military career of the victor of this great battle – but also his personal life through portraits of his family and friends. Drawn from museums and private collections including that of the present Duke of Wellington, the exhibition of 59 portraits and other art works includes rarely-seen loans from the family including a portrait by John Hoppner of the Duke as a youthful soldier and a daguerreotype portrait by Antoine Claudet, in the new medium of photography, taken on Wellington’s 75th birthday in 1844. The family has also loaned Thomas Lawrence’s beautiful drawing of Wellington’s wife, Kitty. As well as tracing his professional and private life, the exhibition considers the attempts of the art world to celebrate the Duke of Wellington’s military successes. Commemorative objects on display will range from royal commissions by Europe’s foremost artists and manufacturers to more modest souvenirs aimed at the domestic market. Wellington’s eventful and often difficult political career will be illustrated by examples of the many satirical prints published in the 1820s and 1830s and the exhibition will also examine the reappraisal of Wellington’s life that took place at his death and on the occasion of his lavish state funeral. In addition to looking at Wellington’s career, the exhibition explores the lives of the soldiers who served with him during the Peninsula War and at Waterloo. Portraits, prints and an evocative illustrated diary help to reveal their experiences.